One of the most common ingredients in Indian food is Coriander spice. 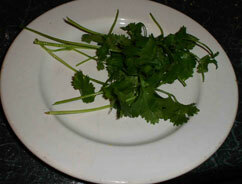 Coriander(dhania, kotimear) is an annual herb sometimes known in the UK as chinese parsley and elsewhere as ciltrano. It is grown for both the seeds, the dried fruit of the plant which give us the coriander spice, and the leaves, which are used as a herb or garnish. Even the roots are edible and are used in Thai cooking for soups and to make a kind of curry paste. The seeds are light brown spheres (like small, pale brown ball bearings) which have a slightly lemon fragrance and flavour. The leaves are bright green and also have a citrus fragrance with a hint of bitterness. They are both very yummy - aromatic and slightly sweet. Coriander spice is very ancient, probably native to the Middle East (possibly Israel) but is now grown all over the Northern hemisphere from Russia to Morocco, you can even find it growing wild in England. It is mentioned in the book of Exodus and seeds were found in the tomb of Tutankhamun and is likely to have been known to the Greeks over 4000 years ago. It was taken to America by the Europeans towards the end of the 17th century. In Indian cooking it was originally only the leaves that were used; use of the seeds was introduced by the Muslim moghuls. Coriander is used all over the world in cooking, it is a mainstay of Middle Eastern cookery, the seeds are used in English Black Pudding and Italian Mortadella. The leaves are used all over the Mediterranean, South America and the Far East. And of course, it is a common basis for Indian curry powders. It is quite often ground fairly coarsely to give a slightly crunchy texture but can be ground finer - it grinds to a fine powder very easily. 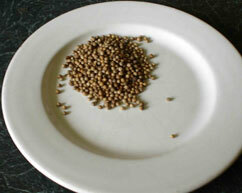 It is best to roast the seeds in a dry frying pan before grinding, this radically improves the flavour. Don't overdo it or you will get a slightly burnt taste, just a few seconds over high heat - just a shade darker - releases the flavour. Coriander is a natural emulsifier, that is it breaks down fats and oils allowing them to mix with water or other liquids. This effect naturally thickens a sauce. It is a delicate but distinctive taste that can be used in anything from the hottest curries to sweets. It is also commonly used as a pickling ingredient. The leaves are often added to curries but they lose there flavour with prolonged cooking so always add them at the end just before the dish is finished. The leaves are also used in Indian cooking to make a paste which is the basis of chutney and sauces. The seeds are a good source of dietry fibre and contain Vitamin C, Calcium and Iron; the leaves are a good source of Vitamins A and C. It is low in saturated fat and Sodium. Coriander spice also has a long association with medicine. It is a natural digestive and carminative, and can even be given to babies for colic. It is an antiseptic and one of the spices which stops meat going off as it kills bacteria in meat. It is generally good for the nervous system and is used in traditional medicines to combat anxiety and insomnia.